For many chefs, there is no time more exciting than spring time. The first green shoots of life start poking up from the long dormant soil. The flavours are delicate, docile and undeniably ‘green’. Spring is also the time for foraging. Many chefs have secret patches of woods in the Rouge Valley, York Regional forest of other haunts for which wild edibles lurk during the first warm weeks of the season. Here at the Beech Tree we are very lucky in having friendly foragers who like to lend a hand and in so doing we’ve scored some great wonders. 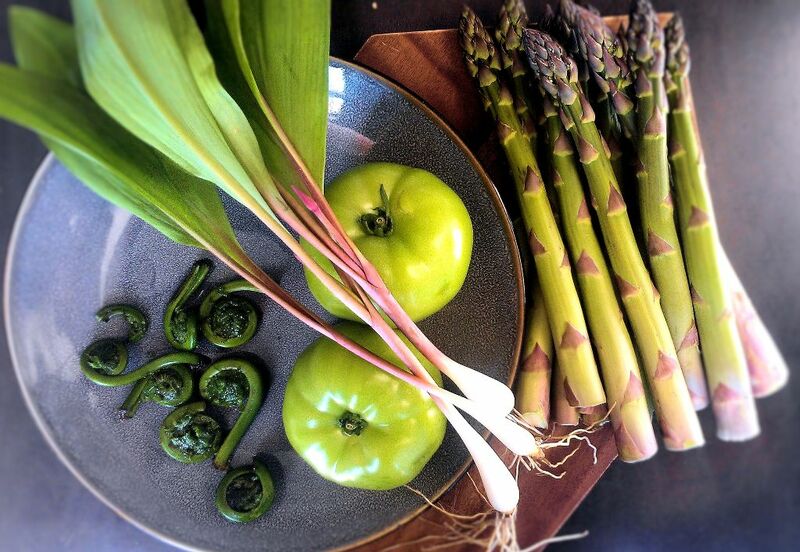 Combined with our ever-important seasonal suppliers, our kitchen is rich with the young, emerald bounty of mid-May. Wild leeks, sometimes called ramps, have a very small window of opportunity. They garnish our gnocchi dish and will likely only be around for another week or two before the shoots are either all gone, or grown beyond tenderness. We are still in fiddlehead season, but not much longer. Enjoy them quickly before they grow up into beautiful, but inedible ferns. The Ontario asparagus just arrived today, fat, ripe and a completely different vegetable experiences than the limp and insipid Chilean spears that have been in grocery stores all winter. Lastly, green tomatoes, the first bounty of the hydroponic harvest lends another level of green to the spring fest. All these ingredients will find their way into regular menu items and specials over the next few weeks. Following up we will start to see the first green peas and fava beans and we just scored sixteen pounds of nettles which will find their way into our pestos. Because we try to source things as seasonally and locally as we can, this will be the only time you see these premium resources at the Beech Tree. Come and enjoy before they’re gone!